I planted a package of Burpee winter squash medley this year that was supposed to contain Acorn, Butternut, Spaghetti and (I believe) Lakota seeds. However, I'm getting some big healthy, but not pictured on the packet, squash growing. They are the shape and size of spaghetti squash but dark green like acorn squash. Is it possible that they cross pollinated? I was trying to look online for a squash that it could be thinking maybe a 5th seed type made its way in the mix, but so far I'm not seeing anything simlar. I was hoping to post pictures but not sure if that's possible on the site. Thanks to anyone who can offer some help! Those seed mixtures tend to be made up of "oops" seeds. Seeds that were accidentally not labeled or got mixed in the wrong way. 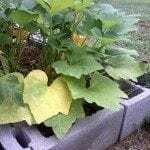 It is entirely possible that you have a cross pollinated seed that is not any one specific squash. Spaghetti squash do start out a green color, but they are not normally that deep of a green. Regardless, it will be safe to eat so you can always give it a try and see if you have a new, tasty type of squash. Thank you Heather, I'm sorry I didn't see that you replied until now. It's funny I noticed that the mystery squash is now turning yellow (sitting on my counter) but I don't know if it's because it was in fact just a very dark green spaghetti squash all along or if it's because I let a type of zucchini turn. My two issues are how to prepare it when I don't know what it is and not wasting it if it turns out to be a zucchini. They very much don't agree with my tummy so I'd hate to cut it open to find out that for me it's uneatable. All that said I did end up finding online a Mexican squash called tatume/tatuma that looks very similar. Ahh the joys of mystery gardening!